One major necessity you should have in an office is a bookcase. Bookcases are not just used for books. You can display and store office supplies on your bookcase. Mark Downs Office Furniture is here to tell you about the advantages a bookcase can offer your office. One obvious way to use a bookcase is to store books on it. This is perfect for an office space where occupants need to readily retrieve information to fact check. Books can be easily arranged on bookcases and bookcases function better than filing cabinets for book storage. If you need furniture to fill a perfect end space for your corners, bookcases are stylish, accessible and purposeful. You can use them simply to enhance the elegance and professionalism of your office space or you can use it to store office necessities such as files, business cards, note pads or other office supplies. Also you can utilize a bookcase is to situate your career achievements like business certificates, college degrees, community awards and trophies. Displaying your accomplishments can increase your business creditability and attract loyal clients and customers to your products and services. Need a bookcase today? 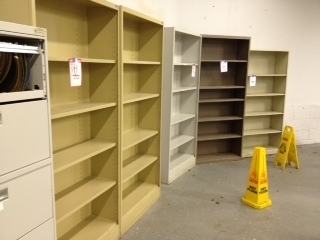 Come see the high quality bookcases we have at Mark Downs Office Furniture at affordable prices. This entry was posted on Friday, July 20th, 2012 at 2:28 pm. Both comments and pings are currently closed.